For most people, motor racing is synonymous with the high-profile F1 Grand Prix format. But when A1 Team India raced to two wins in the 2007-08 season—at Zhuhai International Circuit, China, and Brands Hatch, UK—with Narain Karthikeyan in the driver’s seat, the new A1 Grand Prix format registered its presence in the Indian mind. For the 2008-09 season, A1GP’s fourth, A1 Team India will be represented by Karthikeyan and rookie drivers Parthiva Sureshwaren and Armaan Ebrahim, who will make his debut. A1 Grand Prix racing is still an unknown commodity in India. What makes it unique among other motorsports formats? Andaleeb Sehgal: Most racing formats pitch team against team or they pitch driver against driver, but A1 pitches country against country, positioning itself as the World Cup of Motorsports. We are only in Season 4, as opposed to some other formats that enjoy 50-year or 80-year legacies. So the format is still evolving. A1GP goes into this season with a brand new car that Ferrari has given it. So the A1GP format of nation versus nation is working? AS: It adds a patriotic fervour to the sport. It pushes you that much more. The cars are all standard; each car is exactly like the other, so it is that extra adrenalin that defines your performance on a given day. NK: Yes, it has grown by leaps and bounds if you go by the wins, and by fans and emails. Because of the association with Ferrari, people connect to it easily. Ferrari and motorsport go hand in hand, so it gives us that much more credibility. Everybody is going to be excited to see 24 Ferrari cars competing against each other and then supporting their nation. The intention is not to compete with F1, because it is a totally different concept. When F1 stops, A1 starts and when A1 stops, F1 season begins. We spill over a few races but that’s about it. But A1GP is still a new project. How do you see the format facing up to challenges? AS: For A1 Team India, the immediate challenge is to perform better this year than we did last year—to move up the grid. The second challenge is to turn it into a commercially viable venture. This means attracting more sponsorship for the team. Many brands are showing enthusiasm. NK: With Ferrari coming on board, the quality of the competition will be a lot tougher now. And physically, it will be much more demanding than last year’s car—more powerful, with more downforce, and much faster. My experience in F1 should come handy and, hopefully, we’ll have a good advantage. What is your favourite sport outside racing, Narain? And your favourite sportsperson? I watch and play a bit of tennis. 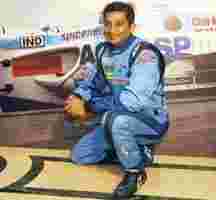 My favourite sportspersons are Ayrton Senna and Michael Schumacher. And what do you drive yourself when you’re not on the track? A Tata Safari and a Porsche 911. In Coimbatore, it is not utilized at all! The roads now are crowded, so it is quite difficult. Sometimes I take the Porsche to the racetrack in Coimbatore and drive it around. Do you get into trouble with the cops while driving? What model was your first car? And finally, Narain, your thoughts on F1 vis-à-vis A1? They are two different formats. F1 has been around for over 50 years. It is the top form of motorsports, but other formats are catching up. Driving-wise, until last year the cars in the two formats were very different, but the Ferrari car we’ll use this year is derived from the F1 car, so now it is pretty much the same. The inaugural race of the A1GP season will be held at Circuit Park Zandvoort in Holland on 5 October. Catch the live telecast on ESPN Star Sports at 5.30pm. What’s this brand of formula racing about? Established in 2005, A1 Grand Prix differs from other formula racing series, including Formula One Grand Prix, in that the competing teams represent different countries and not different teams which assemble their own racing cars. It bills itself The World Cup of Motorsport and its races are held during the Formula One off season. So, for its 2008-09 season, all 24 A1GP teams representing 24 countries, including India, will have the same Ferrari engine and identical chassis. The cars being mechanically identical, success depends to a greater degree on the skills of the driver and his support team. As of now, the total number of races planned for the current season are 11.